Corey Ellis, 23, is the young CEO behind the The Growcer, an Ottawa-based startup that provides the technology to grow healthy produce year-round, anywhere in Canada. “The idea was sprouted partly when we were in Nunavut in 2015,” says Ellis. A recent graduate from the University of Ottawa’s business school, he works alongside his co-founder, Alida Burke. Ellis and Burke applied for a summer program called Startup Garage through the University of Ottawa. With some desk space, WiFi, free coffee, and weekly mentorship sessions, the duo founded their business in the summer of 2016. “In 2016, we lined up our first few customers and we didn’t have any expenses,” Ellis says. These customers are mostly Indigenous communities such as the Kuujjuaq community. Others include the Yellowknife Co-op in the Northwest Territories, the Churchill Northern Studies Centre in Manitoba and the University of Ottawa. The customers buy a 40-foot long insulated shipping container, retrofitted with growing equipment, automation hardware, and sensors. Being inside is akin to a supermarket, with an aisle in the middle and shelves on both sides filled with plants. It is a hydroponic system as each plant is growing in a closed tray with water trickling at its roots. The profitable business which has revenues ranging from two to five million dollars a year, was lifted by its bootstraps without any external investor. It is funded purely by sales. But even then there are challenges. One of their big competitors is the produce from California, where Canada buys its produce in the winter. “We need to be able to compete on a price level where if you buy this system, you are not paying a lot more than at the grocery store,” explains Ellis. But the biggest challenge of all is the scale of the problem that their company is trying to solve. 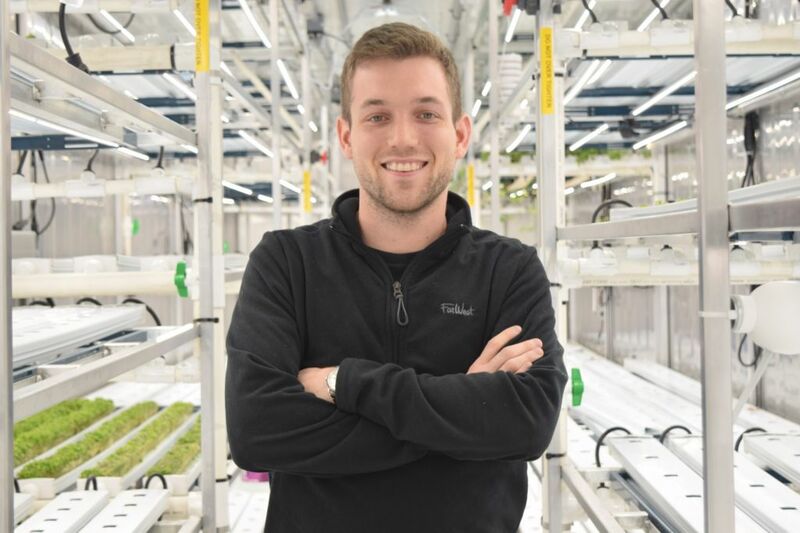 Other American companies have a similar product, but Ellis says that The Growcer system is designed from scratch, and he considers it to be one of the best systems in terms of profitability. Unlike most of their competitors, their system is more expensive but what sets them apart is the fast return on investment. Every time a system is installed, employment is created but the Ottawa-based company only has 10 full-time employees. The newest addition to their team is Hima Merdan, a graduate from Dalhousie University, who is in charge of operations and customer success. He says that despite working here only since last October, the team and Ellis make him feel like he has known them for years. Merdan explained that the general goal that Ellis and Burke wanted was food security in the North as it is expensive there. “They realized using this technology you can start growing lettuce for affordable prices for everyone, anywhere in Canada or the world and that’s really why they did it,” explains Merdan. In the future, Merdan wants The Growcer to be a household name for healthy food production, but also hopes that the business will always stay true to itself. “What they started this business for is to make sure food security is not a problem anymore and so to stay true to that, which we are. As we grow and as we scale, to make sure that it is still at the forefront of our mission and why we do what we do,” says Merdan.